It's double whammy Friday! (that's a thing, right?) We're happy to introduce to you Professor Cocoa P. Nuts, a peanut-y, chocolate-y milk stout. As a colleague and old time buddy of Professor Nutbutters, the new academic on the block clocks in at 6.5% and is perfect for enjoying over intellectual discussions. Ripped Up, the newest addition to our New England IPA series, is a 7% juicy little number. See you soon! One Well Brewing is a little unusual. As there’s no waitstaff, you’ll head to the bar to order your drinks and food when you enter. Then, feel free to play darts and board games while you wait for their great food and selection of beer, made in-house, to be brought out to you. They’ve earned the TripAdvisor Certificate of Excellence from 2016 to 2018. Check their live tap cam to see what’s on draught! Set right between Western Michigan University and Kalamazoo College, University Roadhouse’s name rings true. You can get great food ideal for a night on the town or seeing friends after the big game. Try the “Go Big” option for $1 more and save on some of the draught beers and cocktail options. Located in the historic Star Paper Co. Building, Old Dog Tavern has timeworn, warehouse atmosphere with two bars. Live bands frequently play on its inside and outside stages. With a rotation of Michigan craft beer and cocktails, plus pinball and free ping-pong, it makes for a fun stop with friends. Check their calendar to see who’s playing! Shakespeare’s Pub is a place where you can watch the big game, play pool, shuffleboard, darts, and eat stellar pub fare. Enjoy fresh, free popcorn while you decide which of the 44 beers always on tap you’d like to try. Check their calendar to see which of their nightly live entertainment is coming up. If you plan to visit on Friday & Saturday, you’ll find it plenty busy as it transforms into a college bar. An intriguing combination of a dive bar and brewery, Rupert’s Brew House has friendly staff and a resident bar dog, Uncle Bill, along with a loyal local crowd. Located in an old pharmacy building, you can play ping pong, pinball, and pool while listening to live bands and local comedy. Check out their current tap list, all made in-house, and be sure to stop in for Puppy Monday! Harvey’s on the Mall is a local bar with some tasty, American bar food options, including burgers, pizza and chili. As it’s right next to the State Theatre, it’s the perfect place to go before or after a show. In warmer months, ask for the outdoor seating overlooking downtown. A college bar with two floors, Waldo’s Campus Tavern has pool tables and a ton of TVs, and is accompanied by an outdoor beer garden. There’s drink specials every day and an extensive beer list! Be sure to stop by! With a dozen of their own beers on tap, brewed in-house, the love of beer at Rugger’s Up & Under shines through. Watch the big game, play some pool and listen to local live music the first Saturday of every month. Another bar that caters to the college crowd, Library Kitchen & Tap House has loads of beers on tap in addition to food from wraps and subs to quesadillas and tacos. With plenty of TVs, too, it’s a great place to hang out and watch some football. Take a look at their weekly specials here! 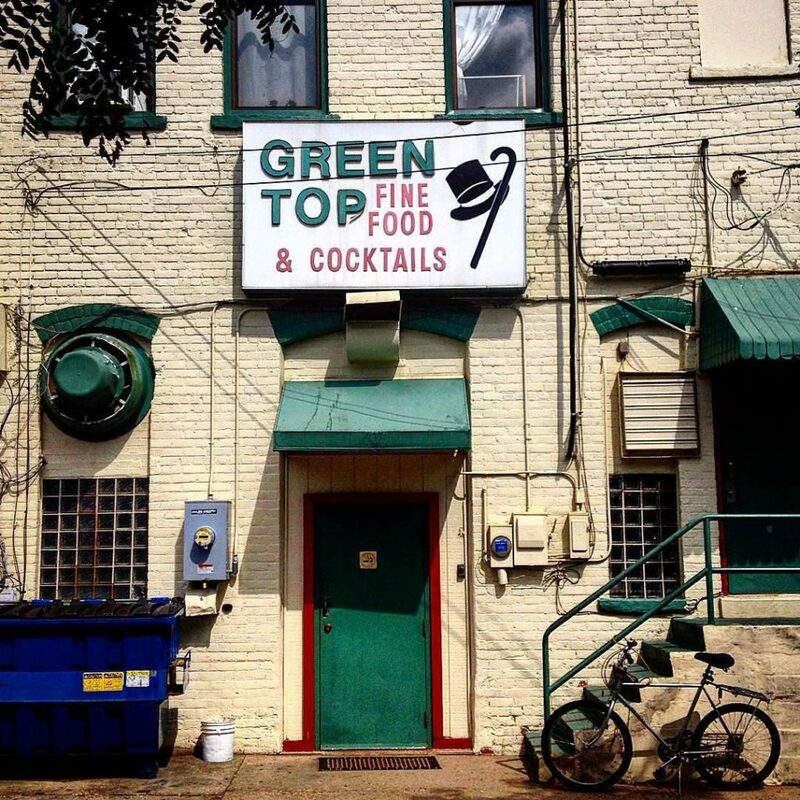 Established in 1920, the Green Top Tavern is a hometown bar and has been owned by the same family for four generations. They serve up mouthwatering burgers to a wide variety of patrons from every walk of life. Sip on some brews while picking your jam on Touchtunes, and playing darts and pinball. All of these watering holes wear their histories on their sleeves, and you’re sure to rub elbows with people from all different walks of life. Check out our live entertainment guide, and be sure to request one of our great guides – especially the Kalamazoo Brewery Map!